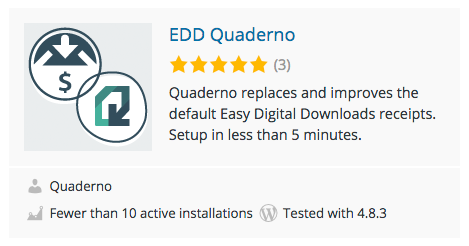 Quaderno supports automated billing and tax calculations for Easy Digital Downloads (EDD). Any time you process a successful order, your store will automatically ping Quaderno, which then creates a beautiful receipt for your customer. You can even set things up so it automatically sends it out, with no manual intervention. Note: You don’t need to be technical to install and use this plugin. We've made it super straightforward. If you use our EDD plugin, you don't need to connect your payment processor accounts (Stripe, PayPal, etc.) to Quaderno because we receive all the necessary data from EDD. And as always, if you have any problems, just ask! 1. In your WordPress Admin Dashboard, go to Plugins > Add New. 3. Click Install Now and follow the prompts. 4. On the next screen, click Activate Plugin. This will activate the plugin and you should see the “Plugin activated” notice. 1. Login into your Quaderno account, and go to Developers > API. Here you’ll find your API credentials. 2. Copy your Private key and API URL and paste them into the relevant fields on your Downloads > Settings > Quaderno page. 3. Click Save Changes and you’re all done! Boom, you're ready to roll with your new Quaderno-fied EDD Wordpress store. We'll take care of everything else from here!